At the dawn at the internet - the earliest dated articles are from 1996 - Matthew J. Rapaport ( mjr ) from California set up a web page system on the topic of knife throwing, titled Thrower . At the beginning, many pages were strings of email posts from the thrower mailing list, but then edited articles on the various aspects of throwing made up the bulk of the website. The topics ranged from throwing instructions to caring for knives and how to make your own back sheath - but also described exotic throwing weapons such as the atlatl or slings. As the first collection ever on the Internet on knife throwing, the Thrower website encouraged hundreds of knife throwers to take up the sport, and gave them a headstart in learning to throw knives. And it was an inspiration for other knife throwing website, such as StickingPoint or Throwzini. 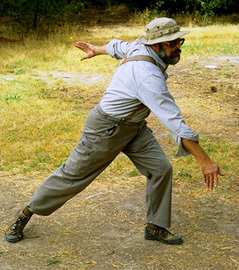 Personally, Thrower was where I learned to throw, and it animated me to publish throwing information in my native language at Messerwerfen.de - which later spawned KnifeThrowing.info. At the beginning of 2006, personal reasons prevented Matthew Rapaport to continue to work on the pages, and he had to take them off the internet. To preserve all the valuable articles and pieces of information for the knife throwing community, with the blessing of Matthew Rapaport, in 2014 a archive copy of the pages was created at https://Thrower-Archive.KnifeThrowing.info. The archive is unchanging (except if linked sites move), and available for many years to come. A big Thank You to Matthew for creating Thrower! Even earlier than the Thrower website, the thrower email mailing list existed. Maintained by Matthew Rapaport, it regrouped knife throwers from all over the world for discussions - and bantering. It's still the heart of the worldwide knife throwing community. Over the years, the technical platforms where thrower people communicate changed repeatedly, but the same group would always find back together. Nowadays in the "Knife and Tomahawk Throwers" group at facebook. If you are a knife thrower, join them! The initial mailing list was migrated to Onelist, which was bought by Egroups, which was bought by Yahoo. At Yahoo, the thrower group still exists - as well as its archive! It had 500 posting/month at it busiest time, and sported 900 members. After the (gradual) migration to facebook, the thrower group there (see link above) has nearly 2000 members (as of 2014). As mentioned above, the archive is static and unchanging. The exception is that, when a site that was linked from Thrower moves, we update this link. Some links were pointing to sites that vanished from the internet, find their original addresses in the list below - sometimes with a hint where you might find similar information now. Some pages have not been included in this archive, because they veered too far away from the topic of knife throwing. Find the info from here now in the card throwing resources. Now available via ThrowingKnives.shop, with new review. See Jasons knife collection at Throwzini. See some of Jeffs knives at Throwzini. At archive creation, Starting Point still exists, but is now a rather empty pay-for-inclusion directory. At archive creation, LINKS2Go still exists, but is now a rather empty pay-for-inclusion directory. Read an explanation on this linklist above.